Last month, Drake teased not one, but two colorways of "October&apos;s Very Own" Air Jordan VIIIs on his Instagram, and now we&apos;re finally getting a chance to the black pair in all its detailed glory. 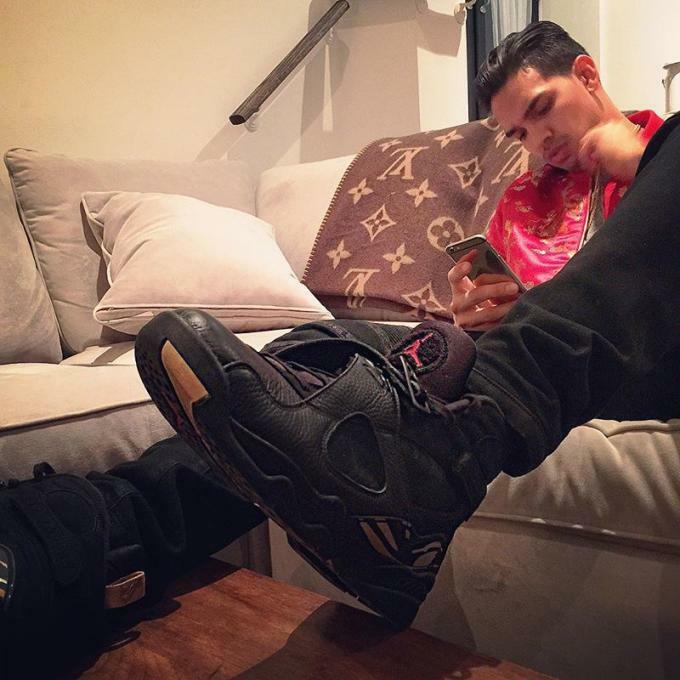 Toronto restaurateur and close Drake associate Levi Bent-Lee took to the &apos;Gram to do a little "OVO" stunting of his own last night, giving us our best look yet at these murdered out VIIIs. Constructed from a black leather upper, the back panel makes use of suede and a really dope gold owl detail at the heel tab. And thanks to a now-deleted on-foot shot captured by Sole Collector (below), we can confirm that the gold accents continue to the outsole and the signature pattern found at the rear of the Jordan VIII. Unfortunately, these are strictly a friends and family exclusive for the time being, but we wouldn&apos;t be shocked if they eventually got an official release like the "OVO" Xs. Keep it locked here for more.